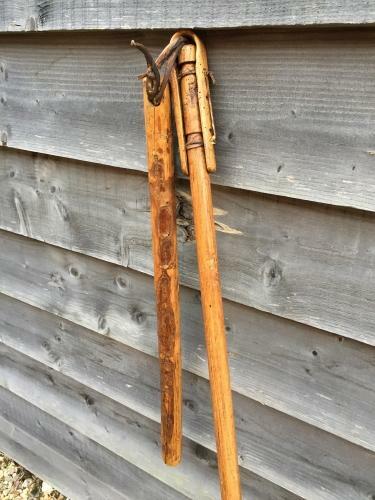 19th Cent Corn Flail in good condition. Flails have not really been used since the laste 1800's so are quite rare to find in good original condition. Used to hand thresh corn in a barn to separate the corn from the husk. All parts of this Flail are original. The long handle has a flared/bulbous end. The swivel has some slight worm holes but this has been treated to be sure. The Swingle is also a hardwood. Known as a Stick and a Half in Suffolk.